The University of Delaware ranking is 70th in the USA and 161st in the world on the University Review College Ranking List. It is ranked as the 76th best college in the states by the USnews, and the 135th best by Forbes. 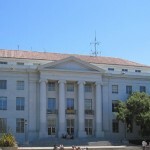 Similarly ranked colleges to the Delaware include Brandeis University, Iowa State University, George Washington University, and the University of Hawaii. The University of Delaware tuition fees are $12,342 for in-state and $30,692 for out of state students. It is a moderately selective college accepting 63.4% of applicants. The total composite SAT Score range ( middle 50%) for accepted applicants is 1060 to 1280. The requirements for ACT (25th-75th percentile) at Composite is 24 – 29. Located in the suburbs of Newark in the United States, the University of Delaware (UD) is amongst the oldest in the country, having been established in the late 18th century. The university has grown to cover over 2000 acres in size and today has seven different colleges, and offers over one hundred degrees at undergraduate level. The university is currently overseen by its president Patrick Harker. The colleges of the university of Delaware, Newark, DE are split up into many different departments, some notable ones include English, Philosophy, History, Biology, Physics, Animal & Food Sciences, and Computer Engineering. University of Delaware photograph by Mathieu Plourde. The University of Delaware encourages open mindedness and with this aim has a very successful scheme for people who wish to study abroad and broaden their horizons; as many as 45% of the graduating population have included overseas studies within their degrees. 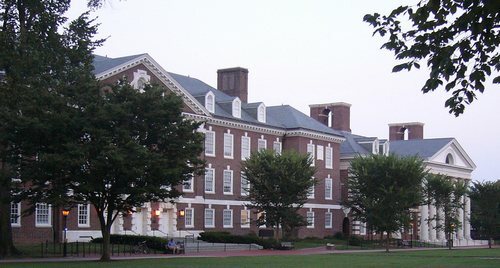 Being a long standing and well thought of university Delaware has many notable alumni and faculty including the philosophers Richard Hanley and Donald West Harward; the science graduates Arnold Rheingold and Shien Biau Woo; and the computer scientists Gene Ball, David Mills and Allen Barnett. 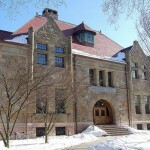 As a member of the List of Public Ivy Schools, it is closely associated with institutions such as University of Connecticut, College of William & Mary, SUNY Stony Brook, and Miami University. Last year there were a total of 22,166 students enrolled at the University of Delaware. Of these, 19,685 (88.8%) were studying full-time, and 2,481 (11.2%) part-time. The vast majority were following an undergraduate program (17,729, 80%), there were 3,679 (16.6%) following a graduate program, and the remaining students (758, 3.4%) were following professional or continuing study programs. More women than men study at the institution with a male: female ratio of 4.4:5.6. Just under forty percent of students come from Delaware State, 13.7% are from underrepresented minorities, 8% are first generation students, and 8% come from low-income families. In 2013, there were a total of 723 (4.3%) international undergraduate students. The major ethnic groups at this level were: White (75.8%), Hispanic (6.8%), and African-American (4.9%), and Asian (4.3%). In-state tuition fees for the year 2014/15 are $12,342 and $30,692 for out-of-staters; these fees include health service, student center, and comprehensive fees. On top of this board costs $4390, and accommodation in a traditional double room $6,810. Books are likely to cost an additional thousand dollars per annum. This brings the total estimated annual costs to $24,312 for state residents, and $42,132 for people coming from out of State. These fees compare very favorable with other institutions in the area, and those of similar academic rank. Grants, scholarships and other aid are awarded to 70% of students, with 55% receiving institutional grants averaging $7,145, and 16% state grant aid of around $5,992. The university offers 330 different academic programs, of which 144 are offered at bachelors level. The most popular degree subjects taken by undergraduates are finance (5.2%), nursing (4.2%), biological sciences (3.8%), exercise sciences (3.7%), and psychology (3.6%). Seven different colleges and three schools offer these programs. With over 22,000 students Delaware is considered to be a medium–large campus university. The main campus itself is located in Newark and covers 2,331 acres. The sports teams compete in 22 varsity sports (10 male, 12 female) in NCAA division I-AA. The varsity teams are known by the nickname ‘the fighting blue hens’. The university employs 4,207 members of staff, of which 1,254 are full-time members of faculty, and 50 part-time. Of these 82% have tenure, and over 90% hold terminal professional or doctorate degrees. The amount of people who graduate within four years is quite high at 67%, and within six years of starting their degree 80% have graduated. Last year the University of Delaware awarded 3,806 bachelor’s degrees, 731 master’s degrees, 231 doctoral degrees, and 258 associate degrees. As it is a large campus, Delaware is able to offer quite a high admittance rate. Of the 23,709 who applied for a place, 14,431 (61%) were accepted, of which 4,250 (18%) went on to complete enrolment. The average SAT score for admission to the university’s Newark campus were a 591 reading score, a 605 mathematics score, and a 588 writing score. 97% of applications provided SATs, with the middle fifty percent ranging from 540 – 650 for reading, 560 – 660 for math, and 540 – 640 for writing. Thirty percent of students provided ACT scores, with the middle 50% ranging from 24—29 for both English and math, 24 – 28 for the composite, and 8 – 9 for writing. It costs $75 to apply to the university; this is the same for both undergraduates and graduates. The admissions website can be reached here, and is located at 210 South College Ave Newark, DE 19716. The telephone number is (302) 831-2000. Many people suggest visiting the campus first before applying as it is considered beautiful, and the university offers overnight programs that help to give potential students a feel of what future campus life entails, and allow you to shadow classes. Most students studying at Delaware are more than happy with the level of education that they are offered, feel that they are learning a lot, and that the university offers very good value for money. A common comment is that the professors are exceedingly intelligent, yet still approachable, and indeed are eager to spread on their knowledge and love of their subjects onto others. Although the level of teaching is considered high, the standards required match that, and many people who found it easy to get straight A’s at high school find it a challenge to gain similar results, or in some cases even to get close to that level, in the college level courses offered by Delaware. Although the university is cheap for instate students many consider it expensive when coming from out of state, with many commenting that most of the financial aid, scholarships and grants are given to in-state scholars. Most out of state students still considered the institution to be good value for money given the level of education being offered. Socially, Greek life is prevalent on campus with many sororities and fraternities. While those wanting a more relaxing way of life report that the traditional campus is nice, with plenty of walks available. Overall, the university is considered a great place to study for those who are self-motivated and prepared to work hard to get the best of their studies, yet at the same time there are plenty of places to let off steam and to relax. It is particularly recommended for people from the state of Delaware itself as they get massively reduced tuition fees and have more grants and other financial aid available to them. Motto: Scientia Sol Mentis Est (English: Knowledge is the light of the mind). The University of Delaware ranking is 70th in the US, and 161st in the world on the University Review College Ranking List. It is ranked as the 76th best college in the nation by the USnews.